In recent days I have made an apostolic trip to Lithuania, Latvia and Estonia, on the occasion of the centenary of the independence of these countries called the Baltics. One hundred years that they lived half under the yoke of the occupations, the Nazi one, first, and the Soviet one, then. They are peoples who have suffered greatly, and for this reason the Lord has looked at them with predilection. I'm sure about this. I thank the Presidents of the three republics and civil authorities for the exquisite reception I received. I thank the Bishops and all those who have collaborated in preparing and carrying out this ecclesial event. My visit took place in a very changed context compared to the one that met St. John Paul II; therefore my mission was to proclaim to those peoples the joy of the Gospel and the revolution of tenderness, of mercy, because freedom is not enough to give meaning and fullness to life without love, love that always comes from God. The Gospel, that in the time of trial gives strength and soul the struggle for liberation, in the time of freedom it is light for the daily journey of people, families, societies and it is salt that gives flavor to ordinary life and preserves it from the corruption of mediocrity and of selfishness. In Lithuania, Catholics are the majority, while Lutherans and Orthodox prevail in Latvia and Estonia, but many have turned away from religious life. So the challenge is to strengthen the communion among all Christians, already developed during the harsh period of persecution. In fact, the ecumenical dimension was intrinsic to this journey, and found expression in the moment of prayer in the Riga Cathedral and in the meeting with young people in Tallinn. In addressing the respective Authorities of the three countries, I have emphasized the contribution they give to the community of nations and especially to Europe: the contribution of human and social values ​​passed through the melting pot of proof. I encouraged dialogue between the generation of the elderly and that of the young, because the contact with the "roots" can continue to fertilize the present and the future. I urged to always combine freedom with solidarity and hospitality, according to the tradition of those lands. Two specific meetings were dedicated to young people and to the elderly: with the young people in Vilnius, with the elderly in Riga. In the square of Vilnius, full of boys and girls, the motto of the visit to Lithuania was palpable: "Jesus Christ our hope". The testimonies have shown the beauty of prayer and of singing, where the soul opens to God; the joy of serving others, leaving the enclosures of the "I" to be on the way, able to get up after the falls. With the elderly, in Latvia, I emphasized the close link between patience and hope. Those who have gone through hard trials are the roots of a people, to be guarded with the grace of God, so that new sprouts can draw and flourish and bear fruit. The challenge for those who age is not to harden inside, but to remain open and tender in mind and heart; and this is possible with the "sap" of the Holy Spirit, in prayer and listening to the Word. Even with priests, consecrated persons and seminarians, met in Lithuania, the dimension of constancy appeared to be essential for hope: to be centered in God, firmly rooted in his love. What a great testimony in this they have given and still give many priests, religious men and women religious! They suffered slanders, prisons, deportations ... but they remained steadfast in the faith. I urged not to forget, to keep the memory of the martyrs, to follow their examples. And speaking of memory, in Vilnius I paid tribute to the victims of the Jewish genocide in Lithuania, exactly 75 years after the closure of the great Ghetto, which was the antechamber of death for tens of thousands of Jews. At the same time I visited the Museum of Occupations and Freedom for Freedom: I stopped in prayer right in the rooms where the opponents of the regime were detained, tortured and killed. They killed more or less forty per night. It is moving to see how far human cruelty can come. Let's think about this. The years pass, the regimes pass, but above the Gate of the Dawn of Vilnius, Mary, Mother of Mercy, continues to watch over her people, as a sign of sure hope and consolation (cf. Second Vatican Ecumenical Council, Const. Dogmatum Lumen Gentium, 68). A living sign of the Gospel is always concrete charity. Even where secularization is stronger, God speaks with the language of love, of care, of free service to those in need. And then the hearts are opened, and miracles happen: in the deserts sprouts new life. In the three Eucharistic celebrations - in Kaunas, Lithuania, in Aglona, Latvia, and in Tallinn, Estonia - the holy faithful People of God walking in those lands renewed their "yes" to Christ our hope; he renewed it with Mary, who always shows herself to be the Mother of her children, especially the most suffering; he renewed it as a chosen, priestly and holy people, in whose heart God awakens the grace of baptism. We pray for our brothers and sisters from Lithuania, Latvia, and Estonia. Thank you! Je salue cordialement les pèlerins de langue française, en particuliers les groupes venus de Verdun, Bordeaux, Nice et Strasbourg. Pour chacun de nous, le Christ est notre espérance. A l’exemple de nos frères en pays baltes, faisons preuve de persévérance dans la foi et faisons mémoire de ceux qui nous ont précédés, pour que Dieu parle à notre cœur et que germe autour de nous une vie nouvelle. Que Dieu vous bénisse. I greet the English-speaking pilgrims and visitors taking part in today’s Audience, particularly the groups from England, Scotland, Denmark, Finland, Norway, Nigeria, South Africa, Indonesia, Malaysia, Canada and the United States of America. In a particular way my greeting goes to the new seminarians of the Venerable English College as they begin their priestly formation here in Rome, and to the seminarians of the Pontifical North American College and their families gathered for the ordination to the Diaconate to be celebrated tomorrow. Upon all of you, and your families, I invoke the joy and peace of our Lord Jesus Christ. May God bless you! Sehr herzlich heiße ich alle Pilger deutscher Sprache willkommen. Mit Freude grüße ich die zahlreichen Schulgruppen, insbesondere die Schüler und Schülerinnen aus Cloppenburg, Hamburg, Meppen und Ostfriesland. Liebe Freunde, seid immer Zeugen für Christus, unserer Hoffnung, der die Gnade seiner Liebe in unseren Herzen erweckt. Der Herr segne euch und stütze euch auf eurem Glaubensweg. Saúdo os peregrinos de língua portuguesa, particularmente os fiéis de Niterói e de Olinda e Recife. Unidos na oração pelo próximo Sínodo dos Bispos sobre os jovens, a fé e o discernimento vocacional, faço votos de que a vossa peregrinação a Roma fortaleça, no amor divino, os vínculos de cada um com a sua família, com a comunidade eclesial e com a sociedade. Que Nossa Senhora vos acompanhe e proteja! أُرحّبُ بالحجّاجِ الناطقينَ باللّغةِ العربيّة، وخاصةً بالقادمينَ من الشرق الأوسط. أيّها الإخوةُ والأخواتُ الأعزّاء، لنختر أن نكون قدّيسين ونداوي هوامش وضواحي مجتمعنا حيث يُطرح أخانا ويعاني بسبب التهميش. لنحدق النظر بذلك الأخ ونمدَّ له يدنا لنُنهضه، لأنه يحمل صورة الله وهو أخ افتداه يسوع المسيح. هذه هي القداسة المُعاشة في الحياة اليوميّة! ليبارككم الرب! Serdecznie witam wiernych z Polski. W sposób szczególny pozdrawiam dyrekcję generalną i funkcjonariuszy polskiej Służby Więziennej, którzy pielgrzymują do Rzymu z okazji stulecia istnienia. Dziękuję wszystkim, którzy towarzyszyli mi w modlitwie podczas mojej podróży. Zachowując w sercu doświadczenie tej wizyty w krajach historycznie i duchowo związanych z Polską, zawierzam Matce Miłosierdzia z Ostrej Bramy was, wasze rodziny i waszą Ojczyznę. Z serca wam błogosławię! Last Saturday, September 22, a Provisional Agreement between the Holy See and the People's Republic of China was signed in Beijing on the appointment of Bishops in China. The Agreement is the fruit of a long and thoughtful journey of dialogue, intended to foster a more positive collaboration between the Holy See and the Chinese authorities for the good of the Catholic community in China and for the harmony of the whole society. In this spirit, I have decided to address a message of fraternal encouragement to Chinese Catholics and to the whole universal Church, which will be published today. With this, I hope that in China a new phase can be opened, which helps to heal the wounds of the past, to restore and maintain the full communion of all Chinese Catholics and to take up the proclamation of the Gospel with renewed commitment. Dear brothers and sisters, we have an important task! We are called to accompany our brothers and sisters in China with fervent prayer and fraternal friendship. They know they are not alone. The whole Church prays with them and for them. We ask Our Lady, Mother of Hope and Help of Christians, to bless and keep all Catholics in China, while for the entire Chinese people we invoke from God the gift of prosperity and peace. I am pleased to welcome the Capitulars of the Missionaries of the Immaculate Conception; the participants in the meeting promoted by the Dicastery for the Laity, the Family and Life and the one promoted by the Daughters of Mercy. I greet the parish groups; the faithful of the Diocese of Alessandria, with the Bishop, Mons. Guido Gallese and Cardinal Giuseppe Versaldi; the Santa Chiara School of Assisi in Avellino; the group of the University of Foggia; the Fondazione Mons. Cesare Mazzolari di Concesio and the pilgrims of Robbio. Today is the liturgical memory of the medical saints and martyrs Cosma and Damiano. 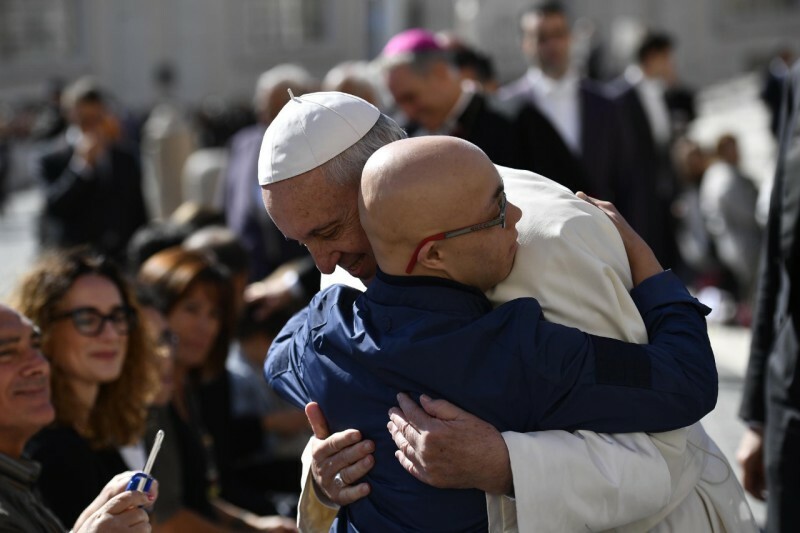 Let us learn from these two brothers, the Christian witness of their faith in the tireless and gratuitous care offered to those who were afflicted with infirmity. Through their intercession, the Lord gives comfort and health to all those who are suffering and sick and inspires generosity and spirit of service to those in charge of health care.